terrie@hydroharvestfarms.com and I will send you the brochure and list to get you started in a School Garden Project. While there are many useful guides for school gardens, this checklist is meant to serve as a guide to developing new edible school garden using Hydro Harvest Farms automatic Vertical Hydroponic Garden. It is meant to help schools get their gardens started. Also, we offer a free written proposal to meet your grant requirements. All grants will ask you how your are spending the money and we will send you a proposal for your garden to help you qualify for the grant. Most school grants are easy to apply for, so what are you waiting for? We are here to help! There is NO bad time to start a garden! Below is the most comprehensive school and community garden information on the web. If you can't find a grant, teaching plan, garden idea here, let me know. We want you to be succesful, you are teaching our children! Many Grants have a due date, and usually it is early into the school year. If you need any information on our gardens, and if you need a proposal for your grant process, then please ask. This is what we do. email Terrie@hydroharvestfarms.com or call 9412388617. Hydro Harvest Farms has been building School Gardens for 13 years now. School Gardens are important. They are the best learning tool, for practically every subject. They are outside, and we all know how important getting the children outside is. They are hands on. Practical. Tactile. Olfactory. Every part of the child's mind and body is involved in a garden. The best lessons are yet to be learned. The Hydroponic School Garden has proven to be the best! It's fun, easy and the kids love watching everything grow, so fast! We are here for support and assistance and that is the most important part of the garden experience.The Grant search and Grant Information sources have been quite a stumbling block in the financing process. In the past year, we have received more information and assistance from this wonderful organization, Florida Ag in the Classroom. We always provide free proposals for the grant process. If you have any questions please ask. We are a phone call, text message or email away. Many Grant opportunities are open now, but do have closing dates. Parents, if you are interested in helping your school with a garden, Forward to a teacher , or let us know and we will help. We know funding a garden can be a challenge, here us a list and you may find just what you need. Check out the list. I always say, take the chairs out of the classroom and move in a garden. The garden will teach a child just about everything they will need to know in life! Education Outside has developed this very convenient Google Calendar of school garden grants. Click the add button on the bottom right to add it to your Google Calendar. Use the "agenda" view to see all the upcoming grants in a list. Visit their site and click on the Kids Garden News link to see newly listed funding opportunities. Their grants page and newsletter are some of the the best places on the internet to find small grants for your garden program! Elementary school classrooms with fifteen students or more may apply for the classroom herb garden grant to establish an herb garden. The funds may be used for supplies such as soil, plant trays, containers, child or youth sized tools, etc. OCFS received additional funding appropriated for the Farm to School Grant Program. Over the next two grant cycles, OCFS will release an additional $5 million in farm to school grant funds to support farm to school activities across the nation. This means that there will be at least $7 million in available farm to school funds in fiscal years 2019 and 2020! Additional funding will help reach more communities seeking to incorporate local products into the school meals program, integrate agricultural education in the classroom, and cultivate and expand school gardens. The FY 2019 Farm to School Grant Request for Applications (RFA) will be released in fall 2018! USDA Healthy Meals Grants Resource Library has grant searching tools. The SPARK Grant Finder Tool helps you locate funding for your Physical Education, After School, Early Childhood or Coordinated School Health Program. Grants can be used for curriculum, teacher training, or equipment. Project Learning Tree offers GreenWorks! grants up to $1,000 to schools and youth organizations for environmental service-learning projects that link classroom learning to the real world. Students implement an action project they help design to green their school or to improve an aspect of their neighborhood’s environment. Teachers, Home School Moms and Dads, Scout Troop, Clubs, everyone, plan a great visit to the farm. This is Strawberry picking season and we have a great educational tour and fun strawberry picking activities for your group. Just email terrie@hydroharvestfarms.com for details and available dates. The Captain Planet Foundation will fund as many projects as its annual resources allow. All applicant organizations or sponsoring agencies must be exempt from federal taxation under the Internal Revenue Code Section 501, in order to be eligible for funding (this includes most schools and non-profit organizations). The Captain Planet Foundation primarily makes grants to U.S.-based schools and organizations with an annual operating budget of less than $3 million. Grants are made for activities that conform to the mission of the Captain Planet Foundation which is to: promote and support high-quality educational programs that enable children and youth to understand and appreciate our world through learning experiences that engage them in active, hands-on projects to improve the environment in their schools and communities. Linda transformed the garden and our Environmental Engineering focus for STEM into an Economics Project; thus, through encouragement for her to write the project and submit it for the Governor's Award for Economic Excellence, her project has been accepted as one of the projects to be considered for the big award. She will be treated like royalty on May 11th at EPCOT completing the day of learning and celebration with a Cirque de Soleil show! Wow! I am so proud of Linda and we truly are indebted to her for her leadership and collegiality with our learning experiences for farming and gardening.....and "growing"! Way to go Linda....so proud of you! Reference Letter Thank You HCC! Take a look one of our School Gardens. This Garden is for Eckerd College in St Petersburg. The staff of the College and the Bon Appetite Management Staff have decided to grow their own! We have made many trips across the Sunshine Skyway delivering our fresh pesticide free lettuce and other seasonally fresh veggies. Well, I guess they decided they can save a lot of money and incorporate the Hydro Harvest Farm garden into their curriculum. Your School can do this too. 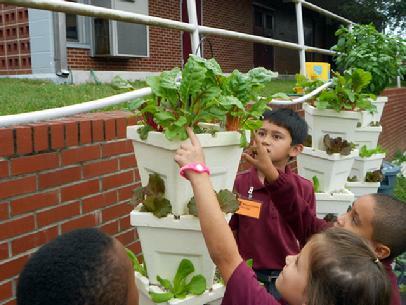 Our School Gardens can be customized to your grant or school budget. Just call John 941-915-7208 or email john@hydroharvestfarms.com and let us know how we can help. The Victory Garden has 12 Towers, all automatic. With 48 stackable pots that have growing space for 192 plants vertically, it also has 12 Ground Pots for lots more growing space. It comes with Pots, Ground Pots, Nutrient, Growing media, PVC, tubing, upgraded emitters, connectors, pump and timer. The conduit used for the poles to erect towers and the water reservoir do not come with this garden when shipped, but the conduit will be included when delivered locally. A 44 gallon garbage container can be used as a nutrient reservoir. The submersible pump with upgraded emitters will make it easy for you to add many more towers to this system. We are approved vendors with most School Districts, or we will become an approved vendor. We will submit an Invoice that will list all of the costs so you can get a Purchase Order. We have worked with many schools and are quite familiar with the process. If your grant doesn't cover this cost, we will work on a great garden to meet your needs. 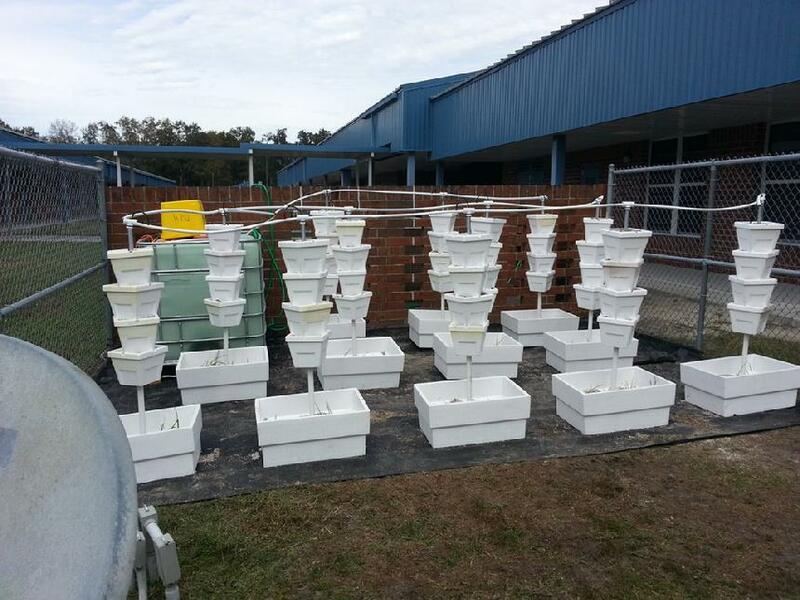 Our automatic gardens for schools start as little as $560.00! $1680.00 for the garden shown to the right.